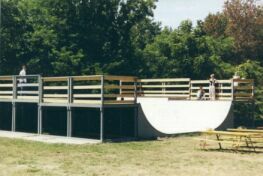 We build anything from Municipal Skateparks to backyard street courses. If your interested in building a Ramp of your own fill-out the form below. We will review your request and get back to you. Be sure to include as many details as you like and if you have any pictures or diagrams, you can attach them in the File Upload section of the form. Please describe the type of ramp you'd like to build. If you have any diagrams, blueprints or pictures you can attach them using the File Upload option below.